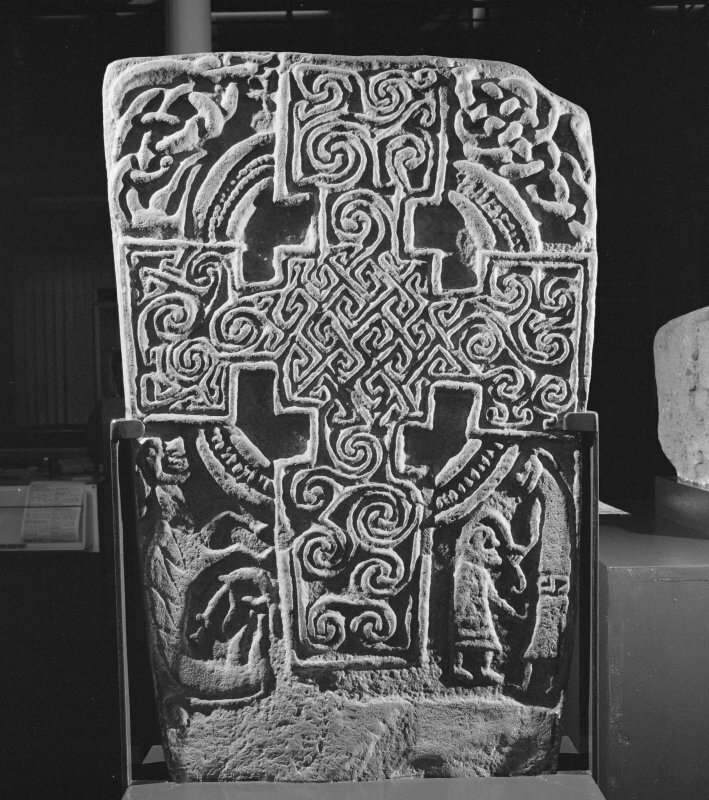 Back detail of Inchbraoch Pictish cross slab. 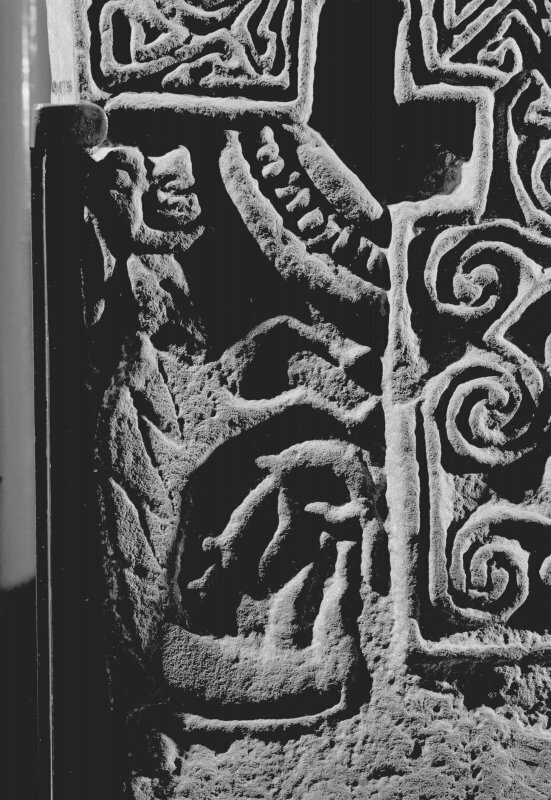 Front detail of Inchbraoch Pictish cross slab. 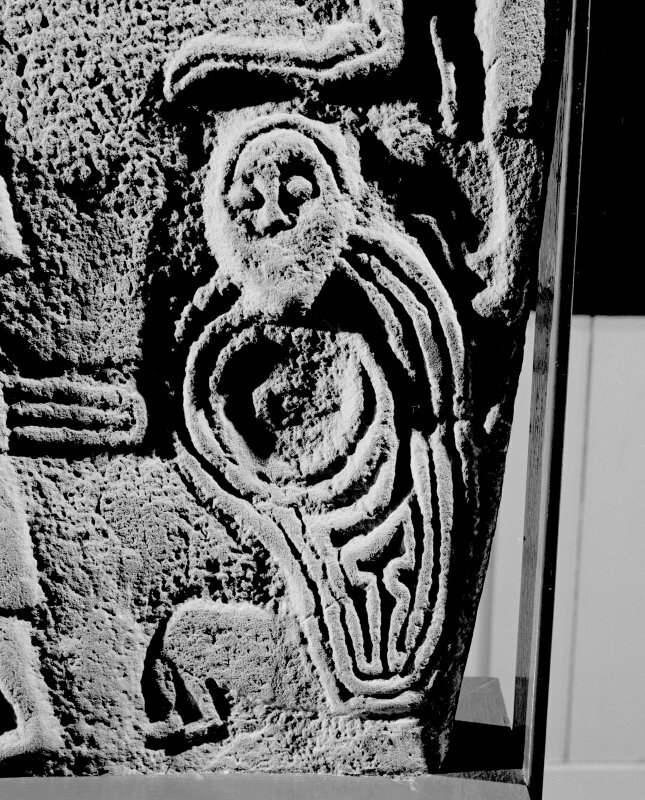 Face of cross-slab on display in Montrose Museum. 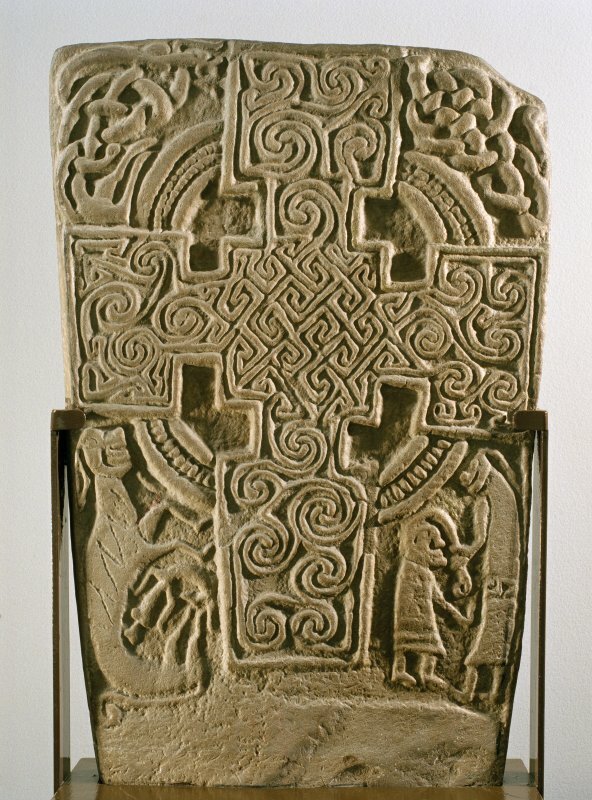 Reverse of cross-slab on display in Montrose Museum. 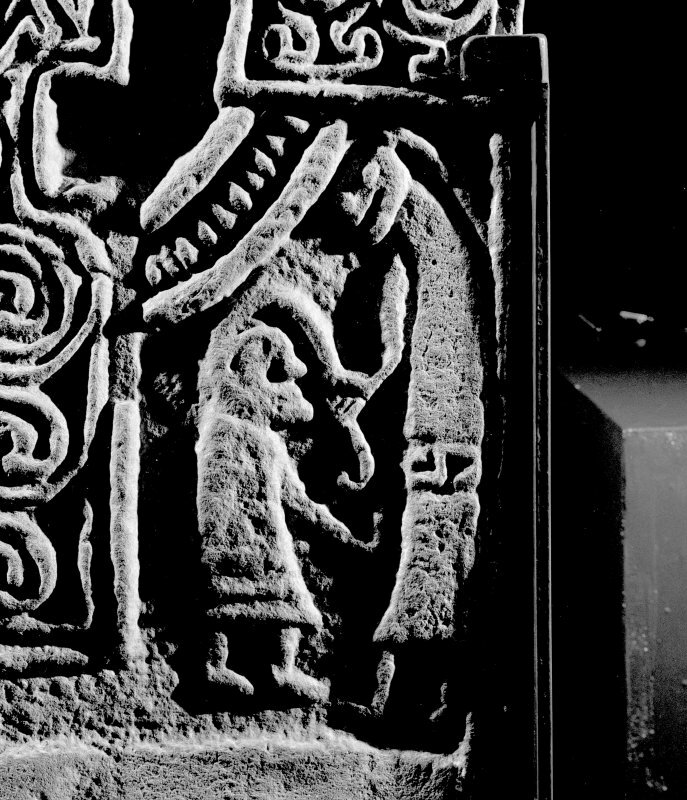 View of face of Inchbraoch Pictish cross slab in Montrose Museum. 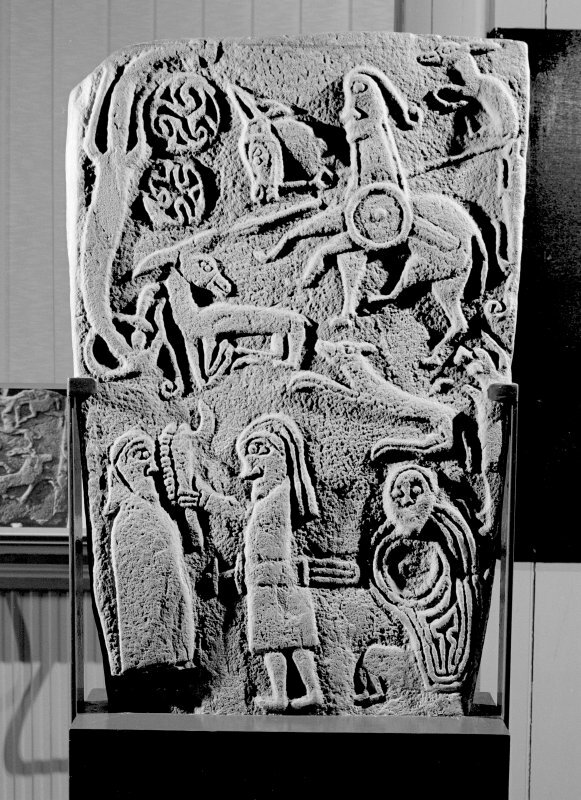 View of reverse of Inchbraoch Pictish cross slab in Montrose Museum. 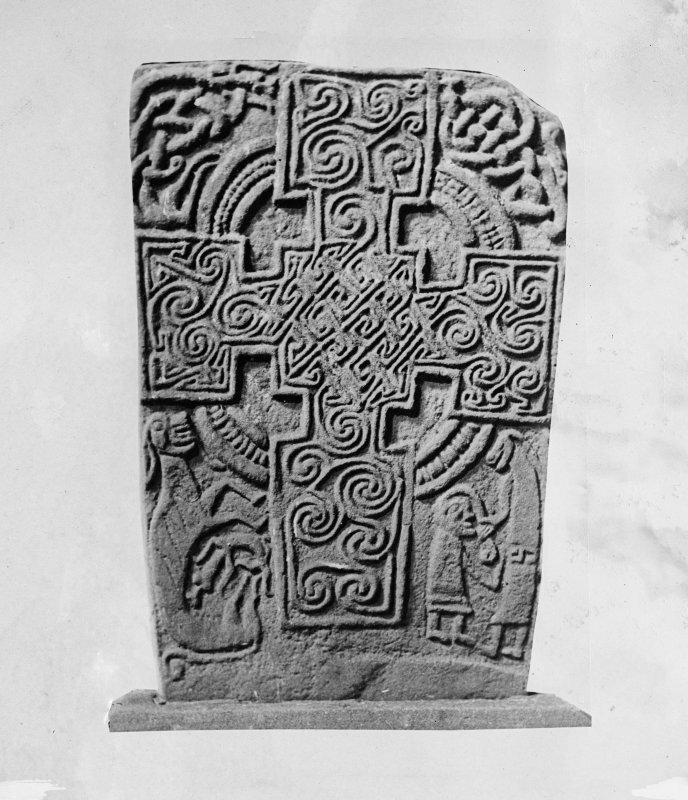 Scanned image of reverse of cross-slab on display in Montrose Museum. Evidence for discovery: found in 1849 in Inchbrayock graveyard and donated to Montrose Museum in 1859. Present condition: good, one top corner damaged. 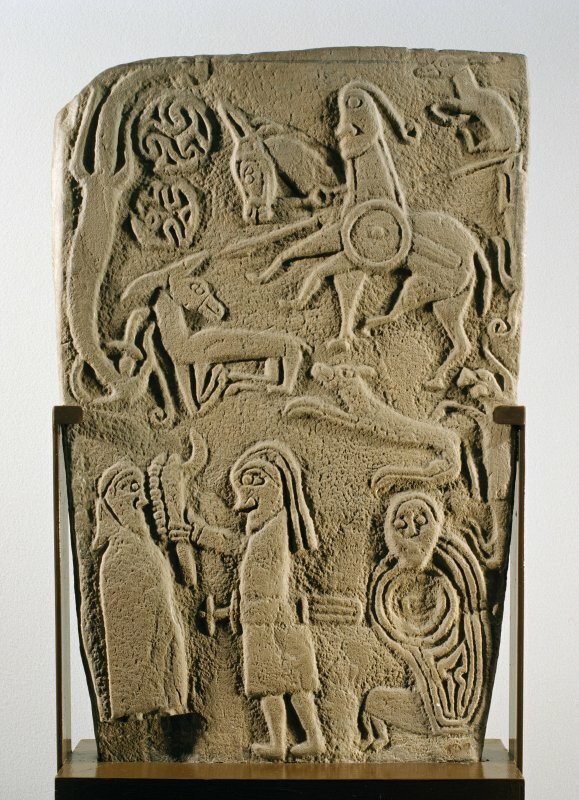 This busy slab has a character of its own and many interesting details. It is carved in relief on both sides with the occasional use of incision. Face A bears a ringed cross with rectangular arms and shaft and a central square, all outlined by a roll moulding. The ring has a pelletted central strip, which is double in the case of the arcs between the upper arms. The central square is filled with key pattern interlace, the strands of which extend into the arms and shaft to form curious spiral patterns described by Allen as ‘too irregularly disposed to be capable of being classified’. To the left of the upper arm is a crocodile-like creature with an elongated body and back leg entwined together. To the right there are two interlaced serpents. 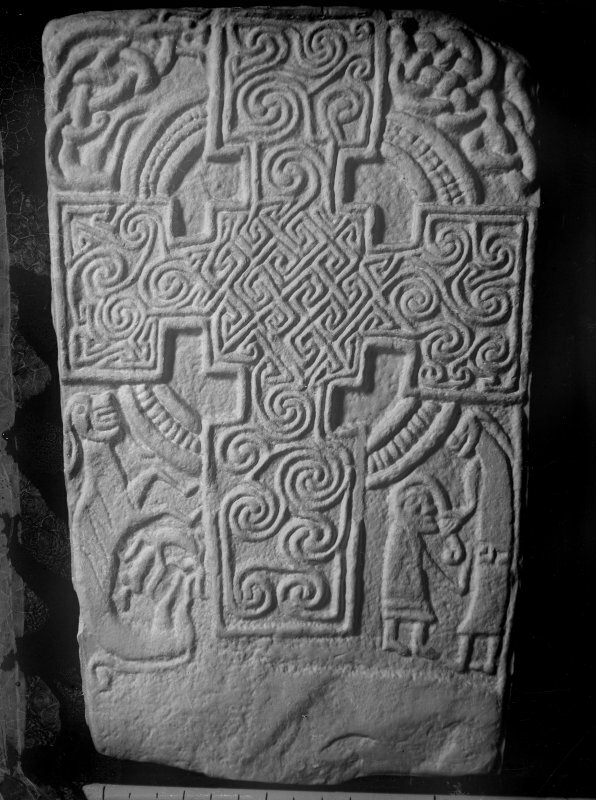 Flanking the cross-shaft on the left is a quadruped with large ear and a mane shown as an incised zig-zag and a small crocodile. To the right are two confronting figures, one tall with a beast’s head who appears to be yanking the overlong hair of the smaller figure. Both are wearing tunics, that of the smaller figure with a decorative hem and that of the taller figure with a belt decorated with key pattern. The crocodile theme continues on face C, where a large crocodile seen from above with bulbous eyes occupies the top left perimeter, and two smaller crocodiles stretch along the right edge of the slab, one seen again from above with bulbous eyes and the other biting the tail of a donkey foal. There is another foal being harassed by a hound across the middle of the slab. Between the foals is a man armed with spear, circular shield and sword, riding an adult donkey (a ‘superb’ rendering according to Beck). Two circular motifs fill the space in front of the donkey. 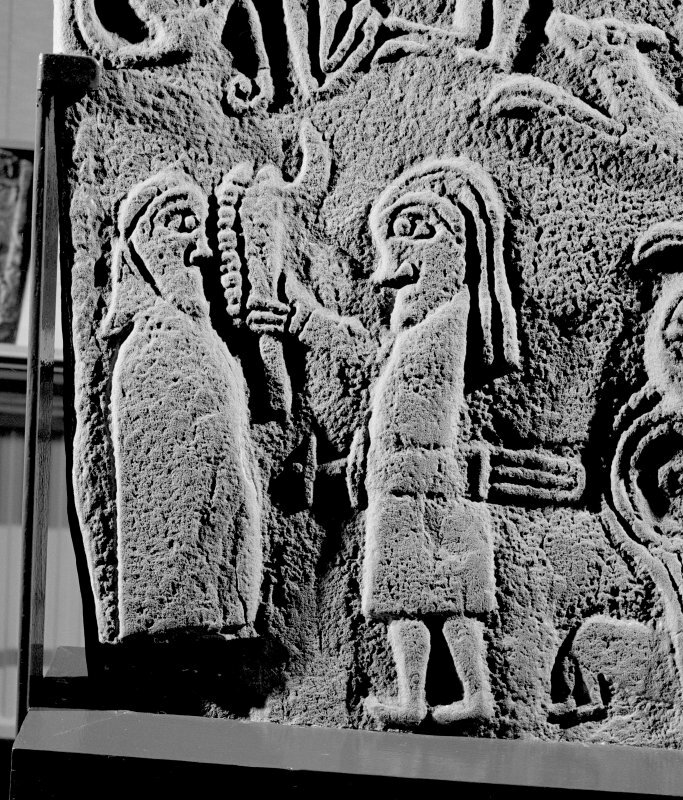 At the foot of the slab on the left is a cleric in a cowled cloak being menaced by a man wearing a tunic and sword, with a curiously wrought club raised in his right hand. 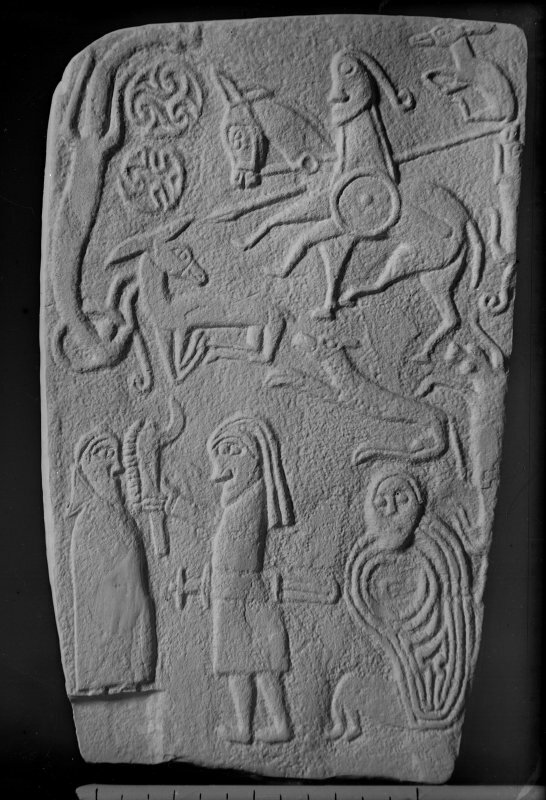 An apparently prone figure in the bottom right corner has been variously interpreted as Mary and Child, a pregnant woman and a bearded man with a circular shield. The striped or pleated garment resembles those worn by warriors on slabs at Kirriemuir and Menmuir. 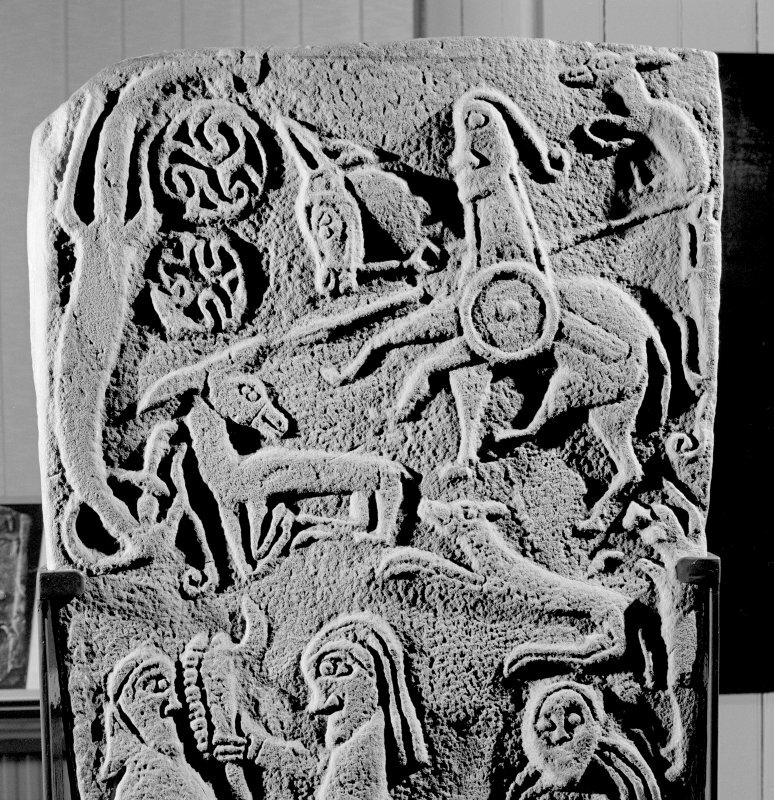 There are clearly Primary references here to more than one Pictish legend as well as to the crocodrillus of the Physiologus (Baxter 1998, 47-8). Primary references: ECMS pt 3, 223-4; Beck 1992, 147; RCAHMS 2003. No. 1 A Class 2 symbol-bearing cross-slab was found in the burial-ground of St Braoch's Church (NO75NW 2). It is an upright piece of old red sandstone, rectangular in shape and measuring 0.73m x 0.48m x 0.05m. It is sculptured in low relief on both sides; the front bears a cross ornamented with a key pattern and scrolling, the arms linked by four quadrants. 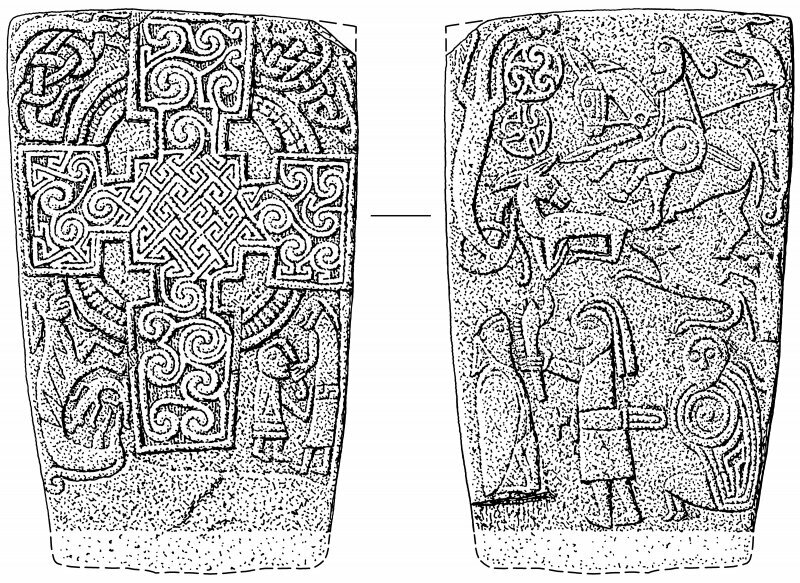 The background bears reptile and snake motifs and a rampant beast and two standing figures in the lower panels. 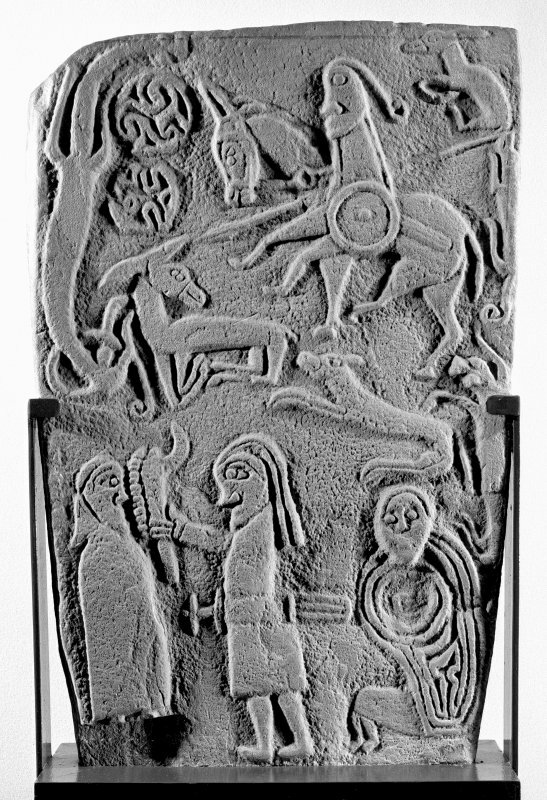 The reverse: an abstract grouping of various figures and animals in low relief. Now in the Montrose Museum (NO 7162 5771). J Stuart 1856; A J Warden 1882; J R Allen and J Anderson 1903; RCAHMS 1978.